A paint-speckled scaffold leans against a concrete wall as paintbrush-wielding students carefully transform it into art. Painted at College Nine and Ten last Friday across from the Namaste Lounge, the mural emblazoned with “Peace Starts Here” stretches across the wall near McLaughlin Drive. It is written in English, Arabic and Hebrew, all the while interweaving patterns and images of the painters themselves at work. The mural was painted primarily by students enrolled in two College Nine classes that focused on the conflict. Gilon headed the collaborative project through online media. Student and faculty commented online to decide which images would be used in the mural. First-year biology student Shannelle Abuseleme, who identifies as half-Palestinian, participated in the mural through a peer-facilitated class on Israel and Palestine. 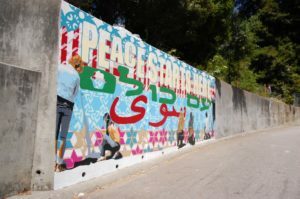 The image, which centered around the word “peace,” was ultimately chosen for its inclusive message and theme of community action. “One of the things that Diana noticed in the images that people were uploading was that a lot of them were images of people doing, people taking action,” said College Nine and Ten co-curricular programs coordinator Wendy Baxter, who also spent time painting the mural. The artists depicted on the wall are actual portraits of student artists, including the student facilitators who directed the peer-facilitated class on Israel and Palestine, Abusleme said. “People have been painting on the mural next to each other, talking about really different ways of thinking about the conflict and really different experiences with it,” Baxter said. The mural subtly addresses the varied voices and perspectives on the issue by using a variety of patterns from the region, including those one might see in a mosque or temple, Baxter said. Participating students were required to fulfill five hours of work on the mural for their respective classes. The classes involved in the mural have used the project as a method of fostering conversation about the issue. Volunteer and College Nine first-year psychology and sociology major Margaux Schindler discussed her perspective on the conflict. Schindler said she hoped the mural presents a message of cooperation.